Amazon.com description: Product Description: An eminent paleontologist with the soul and skill of a poet, Loren Eiseley (1907Ã¢ÂÂ1977) was among the twentieth centuryÃ¢ÂÂs greatest inheritors of the literaryÃÂ tradition of Henry David Thoreau, Charles Darwin, and John Muir, and a precursor to such later writers as Stephen Jay Gould, Richard Dawkins, and Carl Sagan. 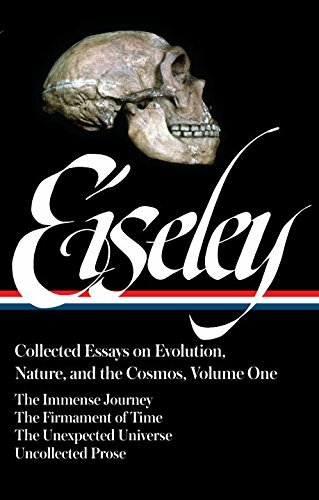 After decades of fieldwork and discovery as a Ã¢ÂÂbone-hunterÃ¢ÂÂ and professor, Eiseley turned late in life to the personal essay, and beginning with the surprise million-copy seller The Immense Journey (1957) he produced an astonishing succession of books that won acclaim both as science and as art.ÃÂ Now for the first time, the Library of America presents his landmark essay collections in a definitive two-volume set. The Firmament of Time (1960), a lyrical and meditative tour de force, looks back at the many ways in which the sciences have been shaped by the changing cultures in which they developed. Examining the role of metaphor in scientific thought, anticipations of scientific discoveries in the works of poets and novelists, and the Ã¢ÂÂunconscious conformityÃ¢ÂÂ of scientific theory to prevailing orthodoxies, Eiseley argues provocatively for the ongoing relevance to scientific progress of dreams, the imagination, and the irrational. A companion volume presents The Invisible Pyramid (1970), The Night Country (1971), and the essays gathered after his death in The Star Thrower (1978). About: An eminent paleontologist with the soul and skill of a poet, Loren Eiseley (1907â1977) was among the twentieth centuryâs greatest inheritors of the literaryÂ tradition of Henry David Thoreau, Charles Darwin, and John Muir, and a precursor to such later writers as Stephen Jay Gould, Richard Dawkins, and Carl Sagan.